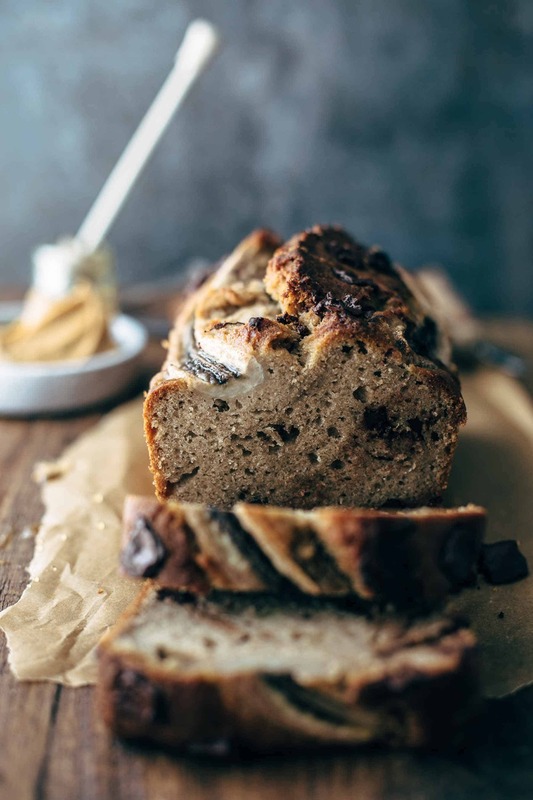 This is the best Chocolate Peanut Butter Banana Bread you will find! 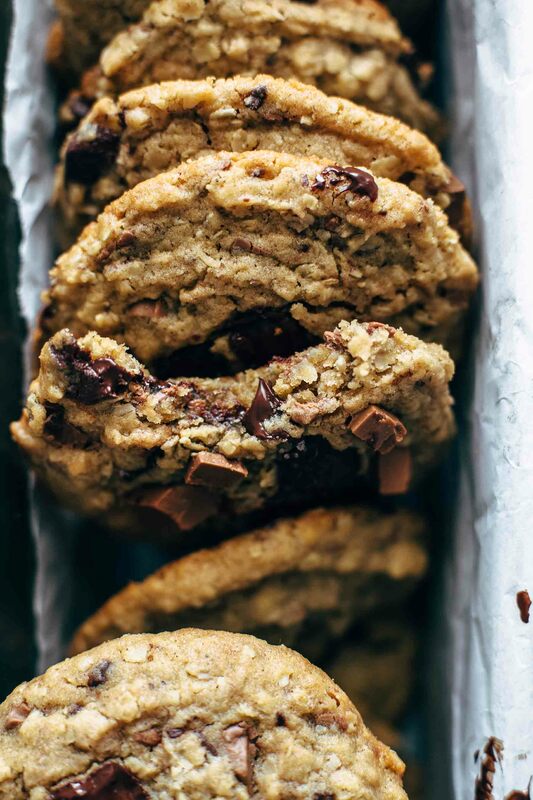 Soft, moist, peanut buttery and loaded with chocolate and banana chunks. I did it again. Another banana bread recipe. 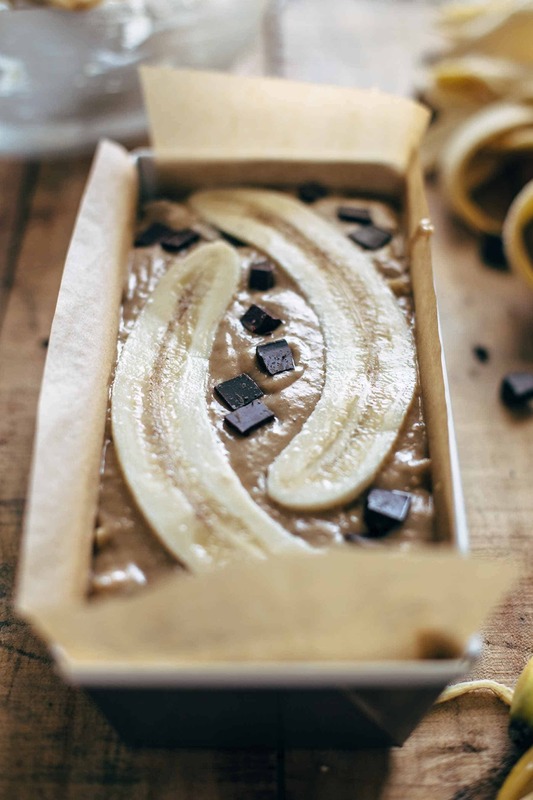 Sorry, but banana bread has to be regularly baked, right? I’m a sucker for everything banana. And banana bread is my absolute favorite banana something. This time I pimped it up. Normally, I go with a thick layer of peanut butter on top of my banana bread. So why not putting the peanut butter into the banana bread, you know what I mean? Ha, don’t think this makes me stopping from smearing a thick layer of peanut butter on top of this Chocolate Peanut Butter Banana Bread. 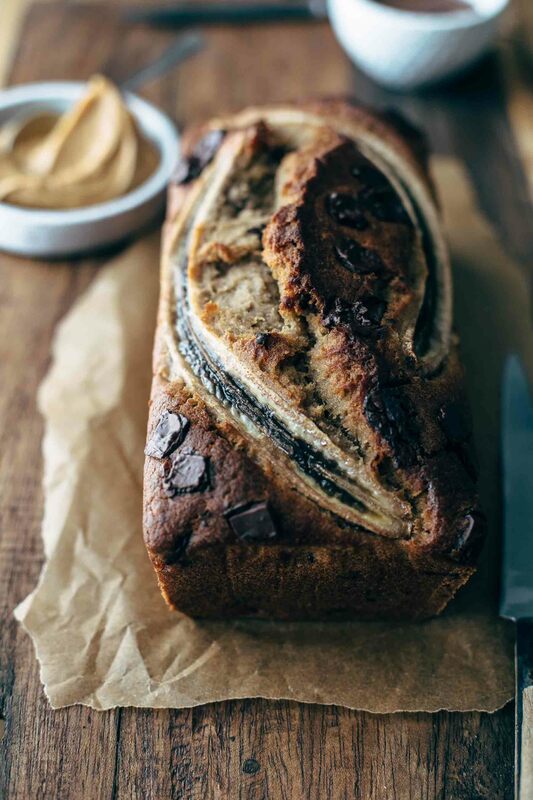 The best is when you spread peanut butter AND chocolate spread on top of this Chocolate Peanut Butter Banana Bread. I have to say that I don’t use regular Nutella anymore because of the palm oil. Although it is not always possible to avoid palm oil, I avoid it as often as possible. It was hard to go away from Nutella because other chocolate spread brands which use no palm oil, are not the best in consistency or taste. At least here in Austria. Lucky me that there is a new chocolate spread on the Austrian market which is as good as Nutella and has no palm oil in it. It is from Lindt. They offer dark chocolate and hazelnut spread. The hazelnut is the one to go. 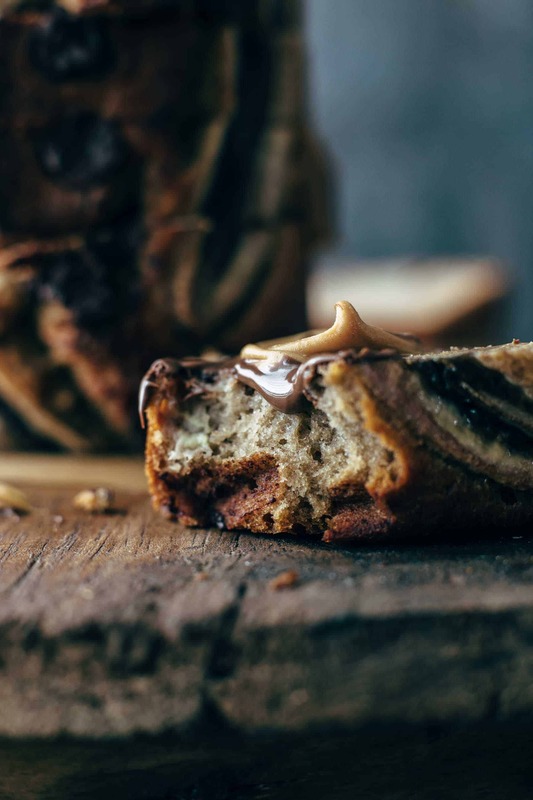 I absolutely love it and since I buy that, I smear an extra, extra thick swirl of chocolate spread on top of my banana bread. The whole point of this recipe? 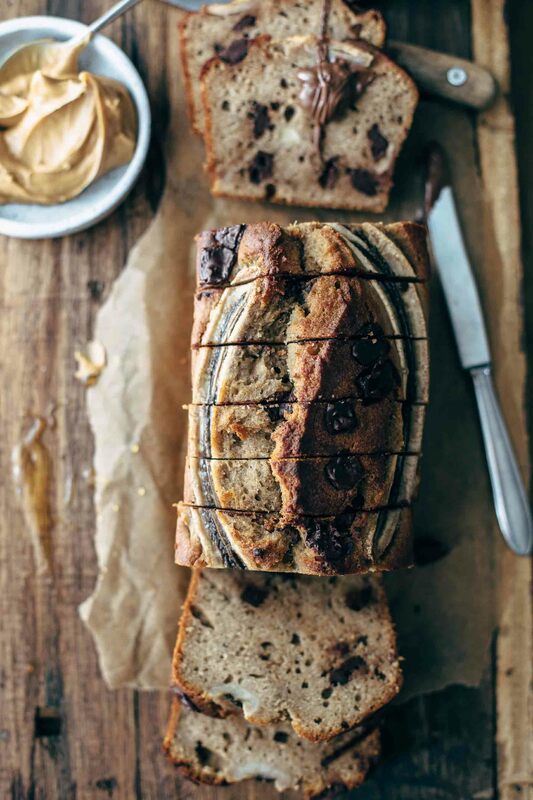 We have 3 times banana in this Chocolate Peanut Butter Banana Bread. And what does this mean? Mashed bananas. Chopped banana. Halved banana. I added 14 oz mashed bananas to the batter. Depending on the size of the bananas these are about 3-4 bananas. Because bananas have different sizes I always weigh the bananas before I add them. It makes a huge difference in texture when adding 3 small bananas or 3 big bananas. And I don’t know if “3-4 bananas” in a recipe tells you anything. I would be not sure how much to add and how the consistency should be. You are unsure if these were too much or too little bananas you added until you cut in after baking. And let’s be honest. Who needs this thrill? 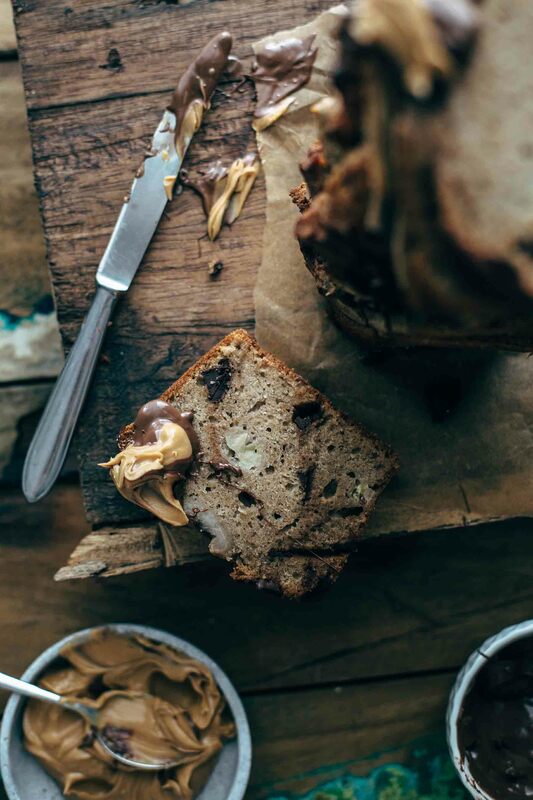 All in all, you need just 10 ingredients to make this Chocolate Peanut Butter Banana Bread. The ingredients list says 12 but it is 3 times banana. So this is one ingredient. In another bowl mix mashed bananas and sugar until combined. Add eggs, vanilla, creamy peanut butter, oil, and dry ingredients. Don’t overmix at any step. Just until combined. Otherwise, your banana bread could end up dry. For best texture, use creamy peanut butter from a brand like Skippy. Don’t use all-natural peanut butter or crunchy one. Both lead to a dry and somewhat crumbly texture. 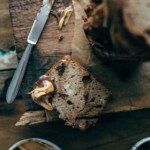 Creamy peanut butter makes the Chocolate Peanut Butter Banana Bread super moist, dense, and soft. Fold in chocolate and banana chunks. I used chopped chocolate, but you can go for chocolate chips. Transfer to a 9×5″ or 8×4″ loaf pan. Then place the halved banana on top. Don’t skip that! You can thank me later. Top with additional chocolate chips if desired. After baking, let cool down. I like mine slightly warm. Even leftover bread slices I warm a few seconds in the microwave. 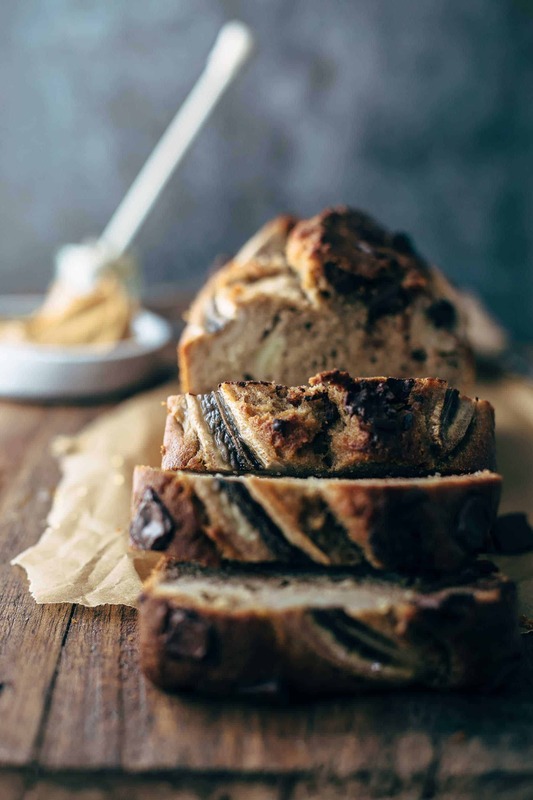 This Chocolate Peanut Butter Banana Bread can be eaten warm or cold As a dessert or for breakfast. Great, right? I bet this bread doesn’t survive the second day! I have got proof. 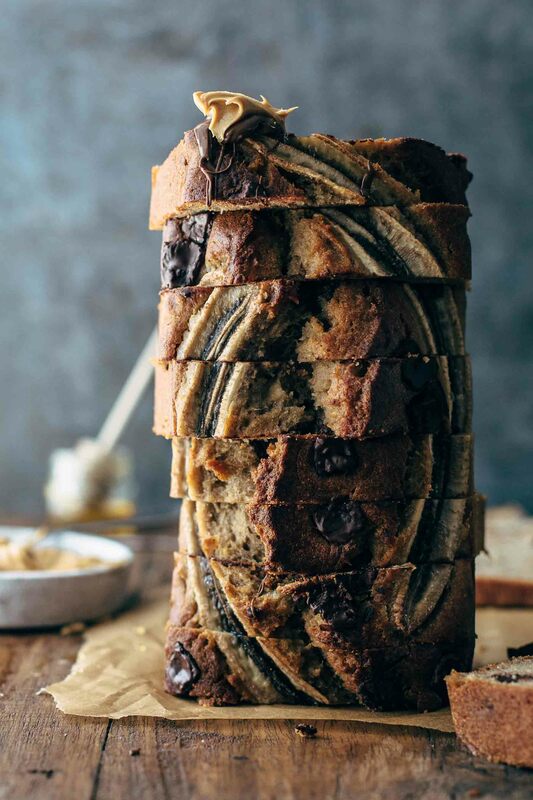 If you make this Chocolate Peanut Butter Banana Bread recipe leave a comment, rate it and tag a photo #alsothecrumbsplease on Instagram! Would love to see your snap! You may also like Bananas Foster Cake, Peanut Butter Oatmeal Chocolate Chip Cookies, The ultimate Chocolate Pizza Recipe, Homemade Brownie Recipe From Scratch, or click here to see all recipes. Preheat oven to 350°F (175°C). Line a 9x5 or 8x4 inch loaf pan with parchment paper with an overhang on the sides to easily lift the bread out of the pan after baking. Set aside. In a large mixing bowl, using a handheld or stand mixer fitted with a paddle or whisk attachment, mix mashed bananas and sugar just until combined for about 1 minute. Add eggs and vanilla* and stir just until combined for about 1 minute. Stir in peanut butter to combine. Mix in oil just until combined. Add dry ingredients and stir to combine. Don't overmix at any step. Fold in chocolate chips and banana chunks just until combined. Transfer batter to a 9x5 or 8x4 inch loaf pan and top with halved banana and more chocolate chips if desired. Bake for about 60-75 minutes or until a toothpick in the center comes out clean. Cover with foil or parchment paper if it browns too much for the last 20 minutes. Let cool in the pan 10 minutes then transfer to a wire rack and let cool completely. Store in an airtight container at room temperature for up to 2 days.